Residents and allies hold a press conference/performance outside Gowanus Houses Community Center on October 3, 2017. It’s been half a year since the last public meeting for the city’s rezoning study in Gowanus. The Department of City Planning (DCP) convened multiple working groups made up of local residents to discuss a variety of topics and create a framework of recommendations that is soon to be released. The agency launched Plan Gowanus, an interactive digital engagement tool and is planning its next public meeting on October 19 focused on schools, transportation and community resources. The Gowanus Canal Superfund project also took some important steps forward, with the city’s plans for the siting of important cleaning infrastructure moving forward in the direction of adoption. Meanwhile, the Gowanus Neighborhood Coalition for Justice has been organizing their own initiatives to draw attention to the issues facing public housing residents. The coalition is an alliance of local organizations, churches and public-housing resident associations that launched in March and aims to draw attention to matters of racial and economic equity in the rezoning study area. 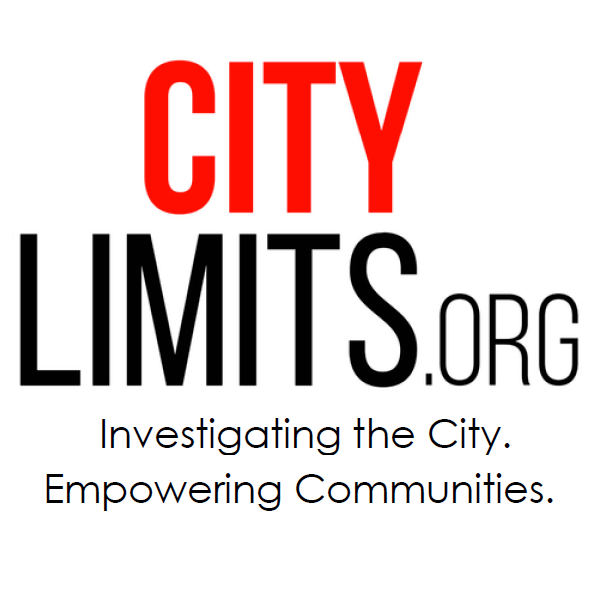 In May, the group wrote to DCP and, noting that many working-class families and small business owners cannot afford the time to participate in regular working group meetings, listed their own policy priorities, including housing dedicated to very low-income families with formerly displaced residents receiving priority in the housing lottery, investments in NYCHA and the reopening of the Gowanus Houses community center, which has been closed for over 10 years, and other demands. In addition, returning to one of the coalition’s core principles—that Gowanus’s future must include support for artists who may not make their living through art and many of whom live in public housing—many coalition members supported a multi-generational arts initiative this summer lead by Gowanus Houses artist Imani Gayle Gillison. Gillison temporarily opened the Gowanus Houses community center to use as a rehearsal space for Making Gowanus, a performance held at BRIC House in August that brought attention to the robust artistic community in public housing. 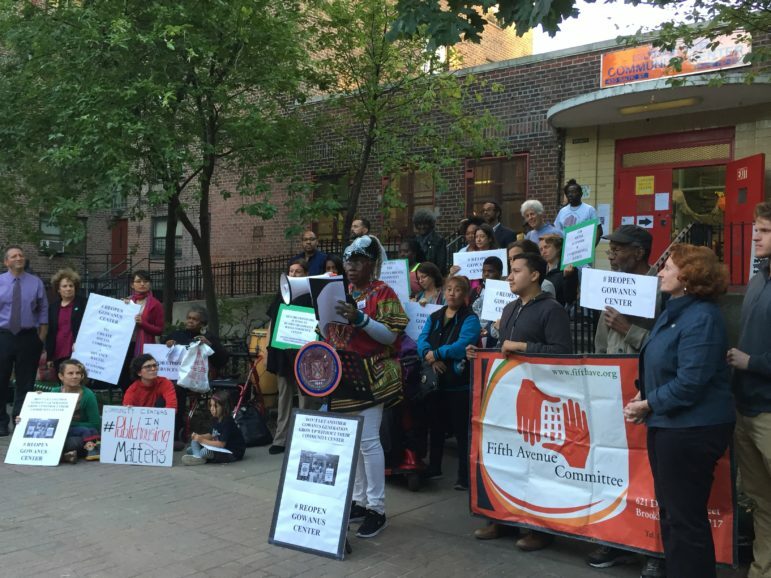 Continuing the push, on Tuesday evening the coalition gathered with elected officials outside the Gowanus Houses Community Center to demand the community center’s permanent reopening. While residents succeeded in securing $475,000 in City Council participatory budgeting funds to the community center for renovations in 2014, the center has remained closed because the Department of Youth and Community Development (DYCD) has not set aside funding to contract with an organization that can run the center, according to local councilmember Stephen Levin. Residents described their visions for a holistic center with programming for seniors, veterans, adults and youth—a space that would encourage artistic collaborations, include a new library program and help residents respond to future climate emergencies. The press conference itself was an artistic performance: Speeches were interwoven with a play satirizing the woes of maintenance delays, a performance by the Gowanus Wildcats Drill team, impressive moves from 80-year-old dancer Mary Glover, and poetry calling for change. “It’s not just a NYCHA issue, it is a Gowanus neighborhood issue, and we are your neighbors! When we prosper, you prosper, when we are rich in culture and can share that culture, you are richer for our culture,” Gillison told the multiracial crowd. Brad Lander, the councilmember representing the rest of the Gowanus and collaborating with the administration on the rezoning study, emphasized the importance of ensuring that plans for the future of Gowanus include the voices of public-housing residents and the coalition, noting that over the summer he’d worked with the Gowanus Canal Conservancy (another coalition member) to launch the Gowanus Green Team, a green jobs apprenticeship program that employed young people from local public housing developments. “As we are thinking about the future of the canal, we cannot do it in isolation,” he said. Beyond the center, it’s not entirely clear whether the coalition will be able to convince the city to agree to one of its central demands: allocating funds for capital repairs in Gowanus and Wyckoff Houses as part of the rezoning. So far, in rezonings approved for East New York and the Far Rockaways, the city has not used its Neighborhood Development Fund, a capital fund dedicated to rezoning neighborhoods, to pay for capital repairs in NYCHA, though the fund has been used to pay for the renovation of a NYCHA playground in Far Rockaway. Stakeholders in neighborhoods with significant public housing populations and where a rezoning study is underway, including East Harlem and Long Island City, have also asked—and so far have not received any guarantee—of investment in NYCHA repairs. Gowanus Houses did receive $100 million for capital repairs as part of the Sandy recovery effort, Levin said. We asked the Republican candidate for mayor for more detail on her approach to tackling the affordability crisis. Bronx Coalition for a Community Vision members turned out in full force to the community board hearing to oppose the rezoning, but their local councilmember is feeling increasingly positive. Neighborhood advocates say the city’s methods of analysis generally underestimate the potential of a rezoning to trigger redevelopment and displacement—but also don’t get why this non-profit, protected building is on the list of developable sites.